The Louvre Museum in Paris France houses one of the several paintings of Madonna by Raphael which he finished during his stay in Florence between the years 1506 and 1508. It is the La belle jardinière, or widely known as Madonna with Saint John the Baptist. The image has a great resemblance with that of the Madonna of the Meadow which is now located at the Kunsthistorisches Museum in Vienna. 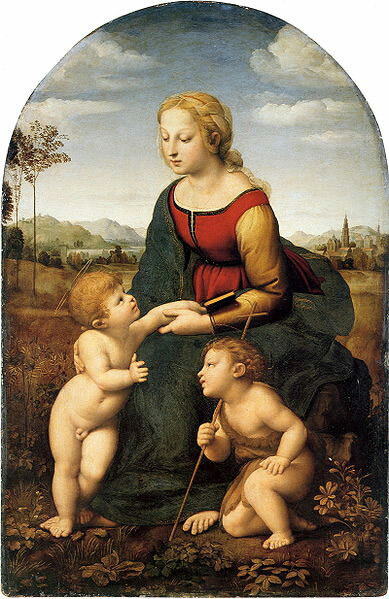 It became one of Raphael’s famous paintings because of the harmony and balance of the picture together with the high quality of elements present. The high standards of the elements used are evident on the face of the Virgin which has become a symbol of beauty for other artists.